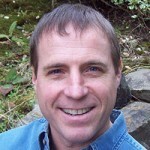 Michael Grabham is a five-time founder and active member in the Seattle startup ecosystem. He runs the Seattle chapter of Startup Grind and he recently started the TV show Start IT Seattle on KIRO7 TV. He is a product and revenue guy who loves to build teams and products. Mike lives in Seattle with his wife Patti, where they run their nonprofit Survive The Streets to help the homeless in Seattle. The Package Guard is the size of a frisbee. 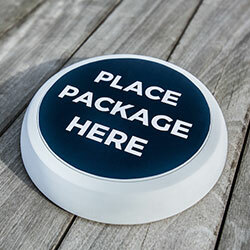 You put in batteries and place it where you’d like to receive your packages. 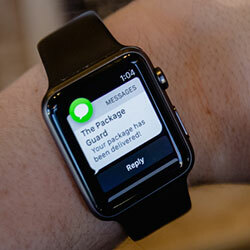 It runs on wi-fi and automatically alerts you via text when your delivery arrives. When you’re ready to receive the package, you simply respond “off,” and you’re good to go. 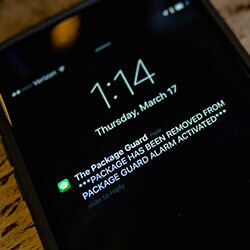 If someone without permission tries removing your package, you’ll receive a text message from The Package Guard and an alarm will sound, scaring the perpetrator and alerting neighbors. 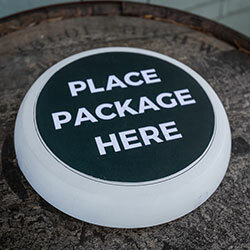 The Package Guard can easily hold multiple stacked packages and with it’s water-sealed design, you don’t have to worry about moving the device inside during inclement weather. Mike Grabham came up with the idea for The Package Guard when he was waiting for a delivery of winter coats to supply to the homeless through his organization, Survive The Streets. You guessed it: the package was stolen from his porch. He wasn’t able to identity the package thief and after that Grabham, who has experience developing tech products as the founder of four tech startups, took a year to create the prototype that would become the simple fix, and it’s foolproof. With a retail value of $80 (significantly cheaper than any of its competitors), Grabham offers a limited quantity for $50 through Kickstarter. In addition to being a necessary addition to any home, The Package Guard is also a terrific closing gift for buyers as well a terrific housewarming gift. 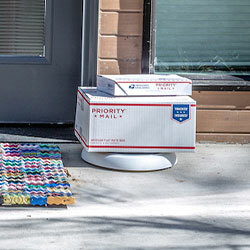 The Package Guard won’t eradicate package theft, but it will help deter it the same way your car alarm or home security system can prevent a break-in or theft. With the online marketplace growing, the number of expected deliveries grows too, leaving more opportunities for theft. 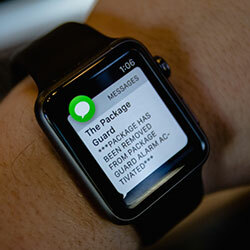 Now more than ever is it i mportant to protect your packages. Although there are other solutions available, none are as effortless, cheap, and functional as The Package Guard. This is a scenario where simplicity really is bliss, because waiting for a package that will never arrive is anything but blissful.